The body had been investigating whether any online content should be prioritised over others, or offered for free while others were not. 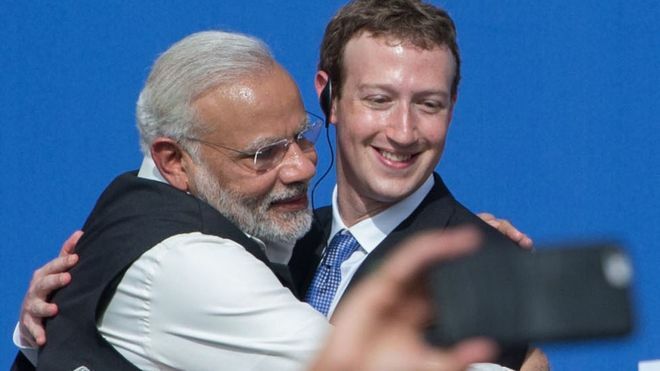 Facebook founder Mark Zuckerberg said he would work to make Free Basics legal. “While we’re disappointed with today’s decision,” he wrote. “I want to personally communicate that we are committed to keep working to break down barriers to connectivity in India and around the world. The World Wide Web Foundation, founded by Sir Tim Berners-Lee, the inventor of the web, welcomed the regulator’s decision. “The message is clear: We can’t create a two-tier Internet – one for the haves, and one for the have-nots,” said programme manager Renata Avila. “We must connect everyone to the full potential of the open Web. Vikas Pandey, digital producer for the BBC in India, said there had been an intense publicity campaign on both sides of the debate, with Facebook taking out front page advertising in national newspapers to defend the scheme. “The people who live in cities and are aggressive users of the internet said: ‘You can’t dictate the terms, give free internet to villagers and then tell them how to use it’,” he said. Facebook founder Mark Zuckerberg has maintained that it is “not sustainable to offer the whole internet for free”. The firm previously said it believed the project – which it launched in 2013 as Internet.org and was offered in 36 countries – had brought more than 19 million people online who would not otherwise have been able to afford access.